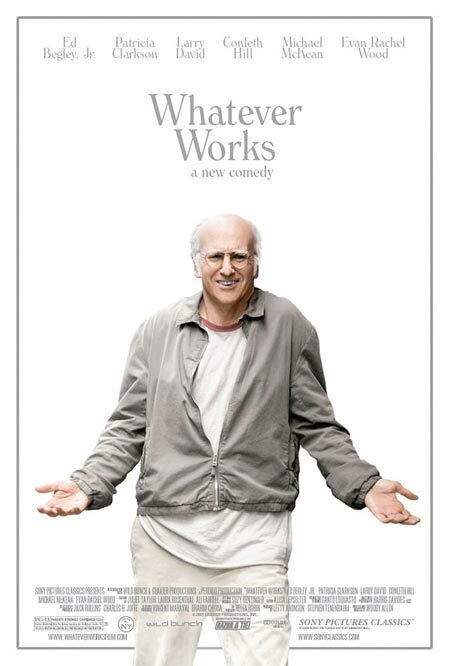 Much has been made about the fact that Woody Allen penned the screenplay for Whatever Works in the 1970s, with Zero Mostel in mind for the lead role. When he died in 1977, however, the idea ended up sitting on the shelf for decades. Until now. To some, this makes the film outdated; to me, it’s a welcome throwback. Sure, the material would have been fresher thirty years ago (especially the device of talking directly to the audience), but who cares? It’s shamelessly silly, unpretentious and, most importantly, it’s funny. Whatever works, right? 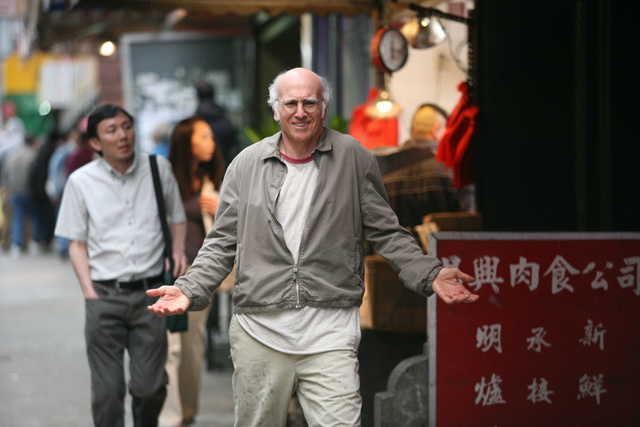 At the film’s center, as the incurably cranky intellectual Boris Yellnikoff, is Larry David in his first significant acting role outside of Curb Your Enthusiasm (blink-and-you’ll-miss-it appearances in Allen’s Radio Days and New York Stories are pretty much his only other forays into the world of cinema). Needless to say, he soars with the character and his imperfections as an actor only make him funnier. Someone more experienced might have spoken each line with rehearsed clarity, but not David. When he delivers the various zingers, he pauses, fumbles and even chuckles at them. In a way, his acting style is quite similar to Allen’s. They’re not interested in realism. They’re interested in channeling a persona; in being over-the-top like the comedians of yore. This style works well for the character of Boris: he’s a witty intellectual, not a great orator. And he’s socially inept, despising most people on the street as much as he despises modern rock music. The plot gets set into motion when Boris encounters a charming but hopelessly naive southern girl named Melodie (Evan Rachel Wood) at his doorstep. She needs a place to stay and Boris reluctantly gives in, thus setting the stage for a Henry Higgins/Eliza Doolittle-like courtship. Wood, buried under colorful makeup and a thick Southern accent, is almost unrecognizable as Melodie. She gives herself fully to the role and loads it with lots of charm. Her performance is reminscent of Mira Sorvino from Mighty Aphrodite, Allen’s other comedy about a naive working girl with a heart of gold. I won’t divulge any more plot details, as it would ruin some of the fun little surprises. All I’ll say is that when Patricia Clarkson enters the film, she steals the show. And Ed Begley, Jr. has his moments as well. Overall, Whatever Works succeeds as light and funny entertainment. The film opens with Groucho Marx’s signature song “Hello, I Must Be Going” and it sets the tone perfectly. While never as manic or even close to reaching the comic heights of a Marx Brothers classic, Whatever Works still adheres to the principle that made those films so good: try out lots of gags and one-liners and don’t take things so seriously. And if you’re willing to give in to this concept and accept the silliness, then you’ll have a great time in the theater. It certainly worked for me.